Media Farmasi is a scientific journal published by the University of Ahmad Dahlan worked closely with Ikatan Apoteker Indonesia (IAI). Media Farmasi published two times a year, namely in March and September since 2002 with ISSN 1412-7946 and e-ISSN 2503-5223. The article published in the Journal Media Farmasi selected by editors and reviewed by the reviewer. 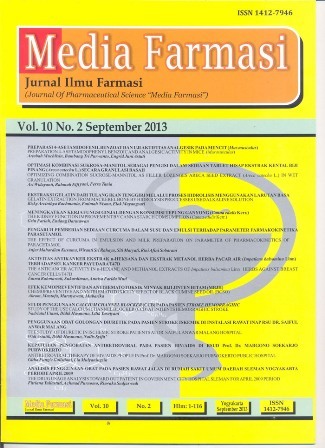 Articles published in Media Farmasi must not be published in other journals or have been previously published. Media Farmasi publishes a review article, original article, as well as short communication in all scopes of Pharmaceutical Science. Media Farmasi is indexed in google scholar. Media Farmasi is planned to be indexed in DOAJ and accredited by DIKTI (DGHE) of Indonesia in 2019.